Chefoo (Yantai; 121.382E 37.542N) was little more than a roadstead on the north coast of the Shantung Peninsula of China until it became a British treaty port in 1858. The harbor was extensively developed but declined in importance after 1907, due to the lack of any rail connections. (The railroad did not reach Chefoo until 1956.) However, it remained a favorite summer station for the U.S. Asiatic Fleet, far enough north to escape the stifling heat of the Philippines. The port was a center of pongee silk production, from silkworms fed on oak rather than mulberry leaves. 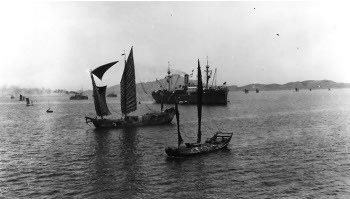 The Chinese areas of the port were occupied by the Japanese on 2 February 1938 and the International Settlement was occupied after war broke out in the Pacific. The port remained in Japanese hands throughout the war.